As we have said before in “FIRE!!! The Cover Story,” fear is a powerful motivator of public policy. The fear of fire is not the only tool in the toolbox of native plant advocates. They would also like the public to believe that non-native plants are invasive, that they will overwhelm the environment if they are not promptly eradicated. So, we will take a closer look at this claim and show that non-native trees are not invading Bay Area open spaces. In “Vegetation Change and Fire Hazard in the San Francisco Bay Area Open Spaces,” William Russell (USGS) and Joe McBride (UC Berkeley) used aerial photos of Bay Area parks taken over a 60 year period from 1939 to 1997, to study changes in vegetation types. They studied photos of 3 parks in the East Bay (Chabot, Tilden, Redwood), 2 parks in the North Bay (Pt Reyes, Bolinas Ridge), and one on the Peninsula (Skyline). These photos revealed that grasslands are succeeding to shrubland, dominated by native coyote brush and manzanita. 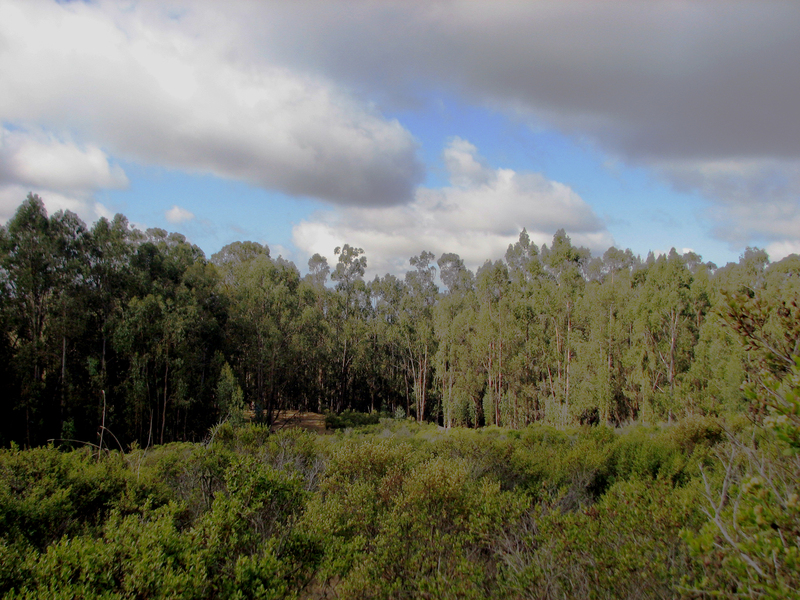 Eucalyptus and Monterey pine forests actually decreased during the period of study. In those cases in which forests increased in size, they were native forests of oaks or Douglas fir. In other words, they found no evidence that non-native trees are invading native trees or shrubs. This is a view of one of the "recommended treatment areas" in the East Bay Regional Park District's "Wildfire Plan" in Anthony Chabot Park. In the foreground are many acres of coyote brush that are about six feet tall. The plan does not propose any "treatments" in these acres of highly flammable coyote brush. In the background is the eucalyptus forest that will be thinned in some places and removed in others. This is not a plan that will reduce fire risk. This study, based on actual aerial photos, tells us that native shrublands are increasing in size while non-native forests are actually decreasing in size. It also tells us that this succession of vegetation types from grassland to native shrubland is increasing fire hazard. There is no evidence that non-native forest is invading the open spaces of the San Francisco Bay Area. The public has no reason to fear that non-native trees will overwhelm our environment. Thanks for giving us this important article. How can we convince people of the truth when they will not look at the evidence such as the aerial photos that were taken for this study? Thanks for putting this evidence out there. It’s yet another Eucalyptus Myth that’s become part of the Nativist mythology.